The story of Half-Hung MacNaghten has captivated people’s imagination for over 250 years. Its a piece of history which has become a local legend in the north west of Ireland with many variations being told. John MacNaghten was born in 1722 into a wealthy Anglo-Irish family. Bartholomew MacNaghten, his father, was a merchant in Derry and a magistrate for Co. Antrim. When John was aged six his father passed away so he was set to inherit the family estate. He was well educated, attended Raphoe Royal school at an earlier age and moved to Dublin in 1740 where he studied at Trinity College. Becoming less interested in studying he lived a lavish lifestyle of gambling and a year later left Trinity without graduating. His gambling problems became so serve he started selling off and mortgaging parts of his estate. Luck for MacNaghten changed when he married Sophie Daniel whose father was Richard Daniel, The Dean of Down. After inheriting a healthy dowry from marrying Sophie he was able to pay off his debts. He made a promise to his new wife to quit gambling when they moved to Dublin. His promise to Sophie fell short and John returned to his gambling ways. By 1756 he accumulated a lot of debt and a warrant was issued for his arrest. His heavily pregnant wife died, some sources suggest it was from a difficult child birth and others suggest it happened during John’s arrest. It was said however, John was heart broken by her death and even contemplated suicide. Family friends rushed to his aid and the 1st Earl of Massereene, who was Sophie’s brother-in-law, used his influence to have him appointed as the collector of taxes of Coleraine. As the tax collector John earned £200 a year but this wasn’t enough for his gambling habits so he stole some of the taxes he was collecting and incurred a debt of over £800. He was found guilty of embezzlement leaving his friends to pay the deficit. Just as John’s luck had run out his lifelong friend came to his aid. 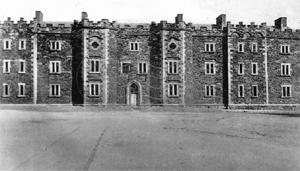 Andrew Knox, an MP for Donegal, who was married to Honoria Tomkins, heiress to the Prehen estate in Derry, took pity on MacNaghten and brought him to the estate to stay. His new hosts likened his charm and its even said Tomkins thought MacNaghten would make a good son-in-law. Their 15 year old daughter, Mary Anne Knox, also took a liking to MacNaghten’s good looks and witty charm. If both were to marry then John would sure to inherit a very healthy dowry. A confident MacNaghten sought permission from Mary Anne’s father for his daughters hand in marriage but Mr Knox rejected the propposal and he was fully aware of John’s gambling problem. John asked Andrew that they never speak of the proposal ever again. Even though the father rejected the idea of him marrying Mary Anne, John continued his relationship with her but also had her believe they had the fathers blessing. A short time later John duped Mary Anne into a false marriage by having them play act the event outside of Prehan estate. Even though Mary Anne stated ‘only if my father gives his consent’ throughout the act, a stubborn John claimed it was a true marriage ceremony. Unaware of the shame marriage Mary Anne’s father permitted the couple to travel together to visit a friend in county Donegal. On route they had stopped at the town of Strabane and it was from there word was sent back to Mary Anne’s father about the marriage. When they arrived at Ards in county Donegal John claimed, yet again, his marriage to Mary Anne so word was sent back to the Knox family. Mary Anne was escorted back to the family estate and MacNaghten was told never to come back to Prehan house again but this only made him more desperate. Claims of the marriage, and counter claims, appeared in local newspapers and when MacNaghten arrived back in Derry to stay with a family member the Knox family sent their daughter to Sligo for her own safety. When MacNaghten learned of her trip to Sligo he followed behind. There he met a friend of the Knox family but fell into a dispute and challenged him to a duel. John was so drunk he couldn’t stand straight and was shot in the leg. Mary Anne’s father now furious and fearing for his daughters took the matter to court. The courts sided with the Knox family, voided the marriage and awarded them damages of £500. To escape the fines John MacNaghten fled to England where he accumulated more debts from gambling and at the same time failed badly to become an MP due to his bad reputation. On learning of Mary Anne being in County Cavan he came back to Ireland under disguise but was arrested for hiding gun powder and being mistaken for robber. MacNaghten knew how to turn on his charm so he told his story of not being allowed to see his true love and wife Mary Anne Knox. As news spread of his plight and separation from his true love he became a celebrity in Cavan gaining him support from the locals people in high places. Andrew Knox was due to attend the opening of Parliament in Dublin and on 10th November 1761 he and Mary Anne departed Derry. 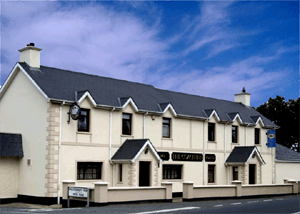 The Cloughcor Inn (Coach Inn) pictured today. John MacNaghten heard of the departure so intended to stop the coach just 5 miles outside Strabane at an Inn called Cloughcor. He gathered the help of four men and found lodging in the area before his attempted abduction of Mary Anne. After a sighting of MacNaghten near Strabane, Andrew Knox suspected an ambush. Knox decided to bring extra security for their travel to Dublin. The horse-drawn carriage pulled into the Cloughcor Inn for refreshments and pulled out again to continue the journey. A short distance from the Inn MacNaghten, along with two other men, stood in the middle of the road armed with pistols. As the coach halted a servant of Knox attempted to subdue the trio but was shot three times. Andrew Knox attempted to fire his weapon but it failed, locals believe servants loyal to MacNaghten may have interfered with the weapons before the party had left Prehan house. As MacNaghten stood aiming at the carriage Mary Anne threw herself in-front of her father to protect him. A bullet from MacNaghten’s pistol struck Mary Anne and in the chaos MacNaghten was also shot. After realising his plans had failed he and his men ran off. The alarm was quickly raised and a doctor arrived to the house where Mary Anne was taken, sadly she died four hours later from her wounds. Within an hour of the shooting a cavalry regiment arrived to pursue MacNaghten and his men. It wasn’t long until MacNaghten was captured and escorted to Lifford Jail a few miles away, the other would be captured later. Lifford Gaol where MacNaghten was held. Awaiting trial for the murder of Mary Anne Knox, John MacNaghten was jailed in Lifford Gaol as the jail in Strabane was not secure enough to hold him prisoner. During the trial John was able to gain a lot of support from locals and news of his romantic tragedy quickly spread. The story caught the hearts of people everywhere but in the end, there was too much evidence against him to escape the accusations. 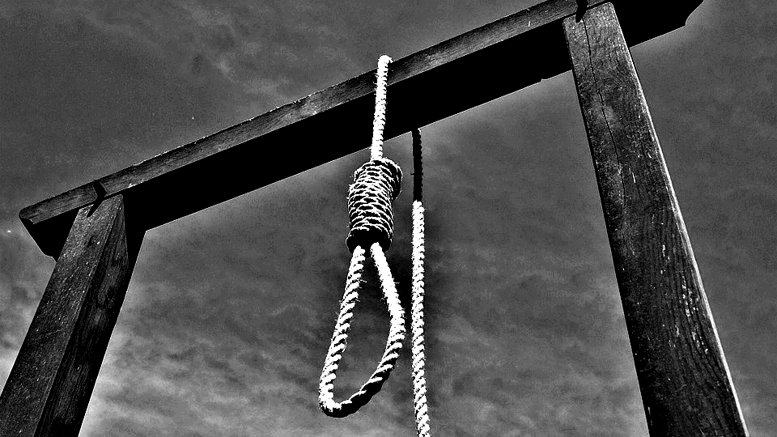 On the 7th of December 1761 John MacNaghten was found guilty of murdering Mary Anne Knox and sentenced to death by hanging. It was reported that no local would build the scaffold where MacNaghten was to be hanged so it had to be constructed by the Knox family. No blacksmith could be found to remove the fetters from him and the executioner himself had to travel from Cavan. On 15th of December at 1pm he was led from the jail to be hanged. Word had spread throughout the land of the romantic villain and a thousand strong crowd gathered to witness his hanging. It is said the crowd,who supported MacNaghten, expressed their grief by waving white handkerchiefs with others believing he deserved to be hanged. The second attempt to hang him was more successful and 250 years later he is still known as Half-Hanged MacNaghten. His body was removed and buried behind Strabane Church where he still rests to this day.